EARLY LOOK AT THE GRADE 1 PATTISON CANADIAN INTERNATIONAL, which will run this Saturday, October 13, 2018. A five-year-old son of Exchange Rate, Thundering Blue has both Group 2 and Group 3 crowns to his name. In less than 10 days, the Kentucky-bred will look to lower the boom on the competition and earn his first Grade 1 victory in the $800,000 Pattison Canadian International at Woodbine Racetrack. Trained by David Menuisier for Mr. Clive Washbourn, the grey, who will venture to Canada for the first time, has produced four consecutive strong performances. Two starts ago, Thundering Blue eked out a neck nod in the Group 2 Sky Bet York Stakes on July 28. Runner-up in the John Smith’s Cup over the same course and distance two weeks prior, he went one better to give Menuisier his first Group winner. Menuisier was taken aback by the York triumph. Dismissed at 50-1 in the Group 1 Juddmonte, contested at 1 5/16-miles at York, Thundering Blue, under Fran Berry, finished third to Roaring Lion. “The real pinnacle was to finish in the frame against a regal opposition, beating the winners of the 2000 Guineas, Dubai World Cup, Dubai Duty Free, Irish Derby and St James’s Palace Stakes,” offered Menuisier. On September 23, Berry and ‘Blue’ teamed to take the 12-furlong, Group 3 Stockholm Cup at Bro Park in Sweden by two lengths. Now, the six-time winner from 20 starts will venture across the pond and onto the International scene. Menuisier is eager to see how his charge fares on the world-renowned E.P. 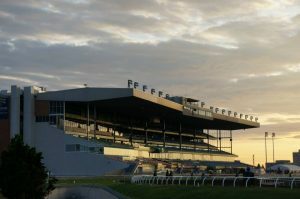 Taylor Turf Course. Berry, aboard for Thundering Blue’s last four starts, gets the call for the International. Menuisier will arrive at Woodbine on October 10, two days after Thundering Blue takes up residence on the Toronto oval backstretch. To dream the possible dream? The connections of English Illusion, a five-year-old Ontario-bred son of English Channel, have answered that question with a spot in the starting gate for the Grade 1, $800,000 Pattison Canadian International, on Saturday, Oct. 13 at Woodbine. Owned by 4U Thoroughbred Racing Stable Inc. and trained by Woodbine-based conditioner Sylvain Pion, the four-time winner from 27 starts heads into the International in top form, having won the OLG Halton Stakes on August 29 and finishing third in the Grade 1 Northern Dancer Turf Stakes on September 15. What’s English Illusion’s biggest claim to fame to date? He was an astute $45,000 claim by Pion on August 5. In the Halton, contested at ‘about’ 1 ½-miles on the Toronto oval’s E.P. Taylor Turf Course, English Illusion, at 8-1, won by 1 ½-lengths in 2:29.72 over ‘good’ ground. With the victory, the chestnut gelding changed his career path. With a solid third-place effort to Johnny Bear – who’ll also race in the International – in the Northern Dancer, English Illusion will now step up again, squaring off against accomplished rivals from North America and Europe. 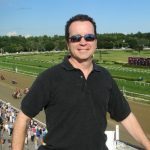 Pion, in the midst of a career year, knows his horse will be a longshot on October 13. He also knows his outsider will be ready for the challenge. “He’s coming into the race in really good shape or else I wouldn’t be going,” said the trainer, who has eight wins, six seconds and three thirds from 42 starts in 2018. “He’s training well. I know the competition will be a lot tougher than the last one (Northern Dancer), but we’re going into this knowing he’s in good order. He’s earned the right to face these horses. Rafael Hernandez, second in the Woodbine rider standings with 124 wins, will be aboard for the International.